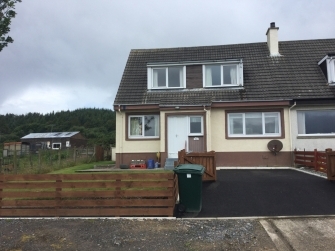 Situated on the Scottish Isle of Gigha, which is only 20 minutes from Tayinloan on the Scottish mainland, 9 Ardminish is a semi-detached house with an enclosed garden, just one mile from the ferry terminal. Perfectly situated for a holiday in the middle of the Scottish Islands, a great 9 hole golf course, local shop and Hotel and also a restaurant are within easy walking reach. Bicycles can be hired from the local shop. The house is situated close to several white, sandy beaches and also many other local attractions. Day trips to Campbeltown, Lochgilphead and Oban can be undertaken.